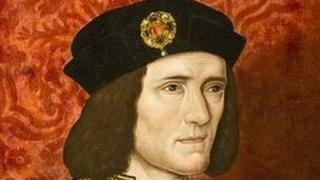 York Minster has rejected calls for the recently discovered remains of King Richard III to be buried there. More than 11,000 people have signed a petition calling for him to be reinterred in York instead of Leicester. But York Minster said it "commends Richard to Leicester's care". The monarch's remains were found underneath a car park in the city, following an archaeological dig by the University of Leicester. In a statement, the Chapter of York said it "understands the strong feeling of some people in York and Yorkshire that Richard III is significant to the history of the county and that therefore his body ought to be returned. "However, the recent verification of the identity of his remains follows a significant period in which Leicester and Leicestershire gained a sense of Richard belonging there, at least in death." He funded the fourth floor of Monk Bar, the city's 14th Century gateway, and a small museum dedicated to him can be found within its walls. He died at the Battle of Bosworth in 1485. Media captionConservative councillor Tom Fox asked BBC Radio York listeners: "Can we really trust Leicester?" The terms of the exhumation licence mean the king's remains will be reinterred at Leicester Cathedral unless a legal challenge against it is mounted. The Minster's intervention came just hours after the leader of Scarborough Borough Council, Tom Fox, said Leicester could not be trusted to look after Richard III's remains. "To be perfectly blunt, the people of Leicester misplaced him for more than 500 years," he said. "Would we really wish to entrust his remains to them again? I think not." In response, Leicester mayor Sir Peter Soulsby said: "All the permissions have been granted and the various authorities involved have agreed that the interment will take place in Leicester."